Form and Fill Liquid Paste – A form-fill-seal machine (form, fill, and seal) with a device to insert a measured amount of liquid or paste into the pouch. Form-fill-seal (form, fill, and seal) machines form a pouch from a flat web of film of heat sealable film and insert product into the pouch before sealing the pouch. Horizontal form-fill-seal machines fold incoming film in half length-wise. The machines then seal and cut the sides of the pouch to a specific length. The two side seals and the bottom fold forms an open top pouch. The pouch is then filled and the top opening sealed. Vertical form-fill-seal machines wrap incoming film around a tube. The two edges of the film are sealed together to form a tube of film. The bottom of the tube is sealed, the product is filled into the pouch, and the top of the tube of film is seal and cut from the rest of the tube of film. Hassia USA, Model SVL20/30, automatic, 8-up vertical, stainless steel, wash down, liquid stick pack form, fill and seal machine rated from 15 to 60 cycles per minute with number of product – depending on materials and application. Pouch size up to 38mm in Width; 225mm in Length with 152mm diameter core. Equipped with Medtronic date coding system and film registration, currently set with (1) 1" diameter forming tubes, (4) 6" long horizontal hot knife seal jaws (1 for each 2 forming tubes) and (8) 9-1/2" long vertical lap seal jaws, with secondary vertical strip seals in lap seal for additional strength. Control panel has PLC controller with swing arm controls, servo drives, metering pumps, CIP system and is capable of doing a hot fill up to 190 Deg F. Last running yogurt sticks, (29ml – 66ml) fills, (38mm x 145mm) and (38mm x 220mm) size pouch sticks, with 800mm maximum pouch material diameter reel. Lane Model L25, vertical, stainless steel, 4-sided form, fill and seal machine rated from 10 to 50 cycles per minute – depending on materials and application. Pouch size range: 4" to 25" in Width; 6-1/4" to infinite in Length. Fill volume range: 4oz to 5 gallons Particulates: up to 1-1/2 square with proper change parts. Temperature range: 40° to 210° F. with proper change parts. 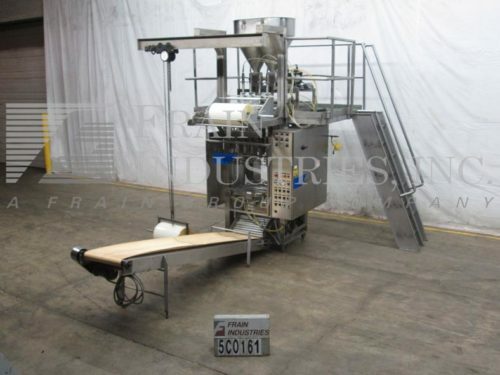 Equipped with dual film mandrels with power unwind, stainless steel split product hopper, (6) 3-3/8 ID x 10" Long pistons, film pull rollers, vertical side seal jaws, side slitters, hot knife cross seal jaws and pouch deflater. PLC with film feed, heat seal, bag deflator, pump, film feed, product counter controls and vacuum system. Film specifications: Two rolls with maximum film width of 25" and maximum roll diameter of 30"
Cryovac Model 2002A, automatic, stainless steel, vertical, form, fill, seal machine rated from 1 to 35 pouches per minute – depending on materials and application. Pouch size range: 6" to 12" in Width; 8" to 18" in Length, Pouch volume: 16oz to 256oz. capable of handling cold fills and hot fills Up to 210 Deg F. Equipped with 19" long vertical lap seal jaw, film assist wheels, bag squeezer, 13" wide horizontal hot knife seal jaws, e-stop and interlocking safety guarding. Control panel with start / stop, conveyor, pump, seal jaw and coder temperature controllers. Capable of handling a wide range of pump able products with or without particulates as well as hot fills. Fill volumes and particulates dependant on filling system. Form, Fill & Seal dual web, four sided seal bag up to 22-1/2" wide x 18" long. Currently set for supported film. Equipped with two 8" diameter (192 oz) pistons with manifold for single or multiple pouch filling. Includes s/s non agitated hopper, electric eye registration, bag deflator, PLC and s/s platform. Has 20" maximum roll diameter with 3" core. Last filling 5 to 20 pound pasta sauce in an institutional size bag. Inever Pack / Matrix Model MLS6/10, stainless steel, 10 head, vertical, stick pack, form / fill / seal machine rated up to 450 packets per minute – depending on materials and application. Minimum / Maximum packet size range: 17mm to 25mm in Width; 60mm to 200mm in Length. Equipped with stainless steel pressurized product hopper has sanitary pistons with liquid dosers and servo drives, both mounted above stick pack machine with CIP and ultrasonic level controls. Film slitters and forming tubes, with (10) 1" OD filling nozzles set on 2-1/2" centers, and 1" long vertical lap sealer with 25" wide cross-cut seal bars. Maximum film reel diameter of 600mm and maximum reel width of 600mm and has film registaration with 120" long x 2-1/4" wide incline cleated discharge conveyor with 3/4" wide x 3/4" high cleats set on 2-1/4" centers. Control panel has PLC controller with touch pad controls and readout, servo drives with vari-speed controller and start, stop, reset, e-stop push buttons and hand held controller. Stick Pack machine mounted on stainless steel base frame with interlock safety doors and statis light. Bartelt, Model IM7-14, automatic, horizontal, Electro Cam, intermittent motion, form, fill, seal machine. Rated from 10 to 100 cycles (20 to 200 pouches) per minute – depending on materials, application and machine configuration. Pouch size range: 2" to 5¾" in Width; 2" to 9½" in Length. Equipped with pouch feed chain system set on 7" centers, forming plow, film tension rollers, registration, side seal, cut-off station, (14) clip stations, suction cup style pouch opener, (2) filling stations with pneumatic valves, top heat seal bar and pouch pick-off station with slitter discharge conveyor for duplex packages. Film Specifications: 18" OD maximum film roll, with 21" maximum web width, on 3" OD core. Control panel with Koyo controller, touch screen display, push button start/stop and digital temperatue controllers. Mounted on heavy duty base frame.